Taste test: This was one of the more unusual flavors to come along in a while. Based on the name, it sounded like I might be taking a risk by trying these. But Kettle delivered a very tasty chip here. The goat cheese taste was very subtle, and eveyone enjoyed the roasted red pepper taste. 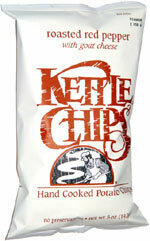 The underlying crisp, crunchy, wiggly, irregularly shaped Kettle Chips were excellent as always. 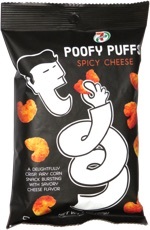 Smell test: Definitely unusual, kind of cheesy, but not really bad.